how and why they are awesome for massage therapists! Electric massage tables are durable, comfortable and allow the therapist the ability to move the table up or down as needed. The nicest feature is that one pedal controls the height adjustments easily and quietly. This feature is not only great for the client, but also for the practitioner. It allows him/her the ability to move freely and to perform at his/her best. Typically, there is a 3-inch, multi-layer, thick foam padding that will keep your clients totally comfortable during the massage. Some also offer heat, adjustable armrests, adjustable facerest, and can come in different widths. Most feature rounded corners and luxurious upholstery. Another great feature is it's ability to hold heavier body weights. This is because they are made of very heavy duty material which makes them feel durable and stable to your client. For someone who is large, feeling comfortable that the table will hold them, will make the massage experience much more relaxing. This may encourage them to return more often. These stationary massage tables are usually heavy (180-240 lbs). Most massage therapists purchase the less expensive, non-electric portable models. However, spas often have the more plush electric massage tables. Therapists will usually admit that they would love to own an electric or hydraulic massage table, but they can be quite costly. Although the electric Oakworks massage tables are popular, well-built tables, Earthlite, Stronglite and Custom Craftworks massage tables are all quality built electric tables. Cost of electric tables range from $500-$4000, depending on features, brand, and style. If price is an issue, as it is for most of us, you may want to check massage schools in your area to see if someone is trying to sell a used electric massage or treatment table. Although basically the same, the hydraulic massage table raises and lowers electronically through a hydraulic lift system, which gives the therapist the ability to raise and lower the table extremely quietly. The height level of the table can also be adjusted during treatment without your client having to move. Again, these tables are very expensive and cannot be moved easily, however they provide outstanding comfort for your client. 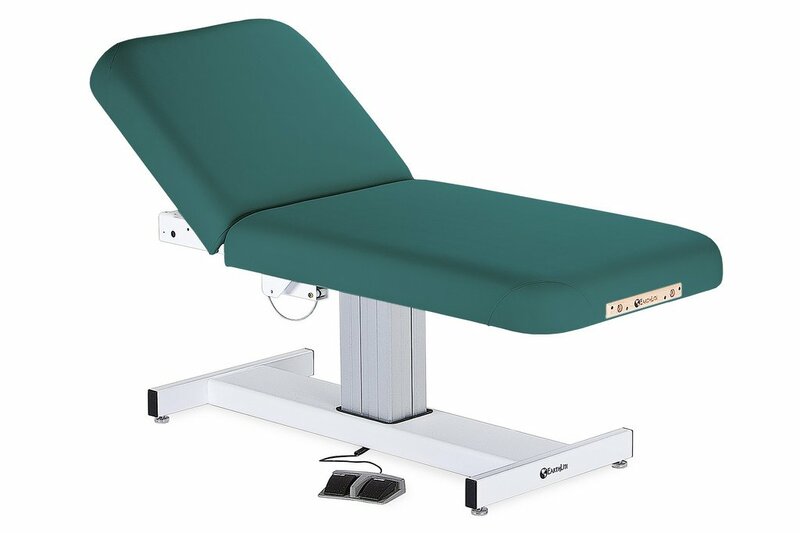 Earthlite Everest Electric Table now has a Lifetime Frame Warranty and can adjust easily for comfort of clients and therapist. It is also one of the most affordable tables to purchase for your business. It holds up to 600 pounds, has either an oak or maple base, locking casters, hand and foot controls, and tilt features. Oakworks mission is to be the manufacturer who truly provides exceptional equipment for the needs of professions and their clients. From massage therapists to chiropractors to spa owners, many depend on their massage tables' ergonomic design, safety standards and relaxation features. This is one of the best electric massage tables around, and it will provide durability and strength for many massages. Great for all clients, but especially easy and safe for wheelchair transfer, elderly, and folks with mobility issues due to muscle tightness.